When visiting Japan in the spring, no one wants to miss the cherry blossoms. Japan has turned cherry blossom viewing, or hanami, into both an art and an event. 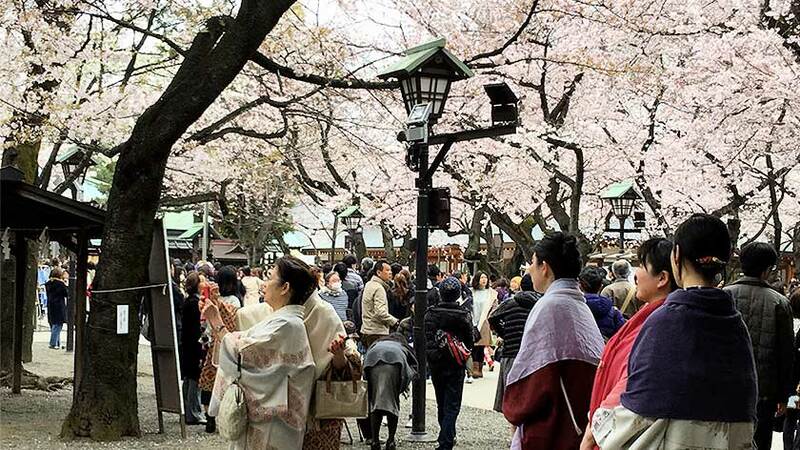 While the areas where cherry blossom viewing takes place is generally wheelchair accessible, there are some things that people with disabilities should take into consideration. This one is pretty obvious, but at the same time it can be hard for people not used to Japan’s population density to fully grasp. 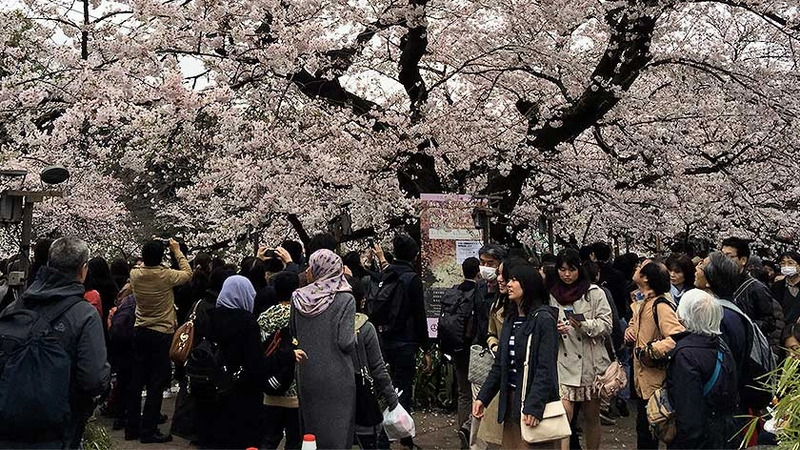 The images often used of crowded to overflowing trains can also apply to cherry blossom viewing at famous places. This can be particularly difficult for people in wheelchairs or with other mobility challenges. Many famous locations have a path that viewers follow and so you can find yourself stuck in a human current slowly moving forward. Instead of looking up at and enjoying the blossoms, you spend your entire time trying not to bump into other people or getting bumped into yourself. While it may be hard to enjoy the view at your own pace, you should definitely take the opportunity to try this experience. It goes without saying, but when you visit a crowded place, expect lines at the toilets! Especially when everyone is drinking beer liberally! As mentioned before in our post on accessible toilets in Japan, nearly every park in Japan has toilets that are wheelchair accessible. While they are generally respected as a place for wheelchair users, mothers of young children and the elderly, sometimes they are used by able-bodied people. So, you may want to give yourself plenty of time and/or use the nearest train station’s toilet. Additionally, while stocked with toilet paper during normal days, it is reasonable to expect that it may run out on crowded days, so bring your own toilet paper. There is a saying in Japan “hana yori dango” – or “dumplings over flowers” – which means “practical over aesthetics.” In other words, flower viewing is an excuse to eat and drink more than looking at flowers. Many parks will have a small city of food trucks where you can get anything from salted fish on a stick, to Turkish doner kebabs! 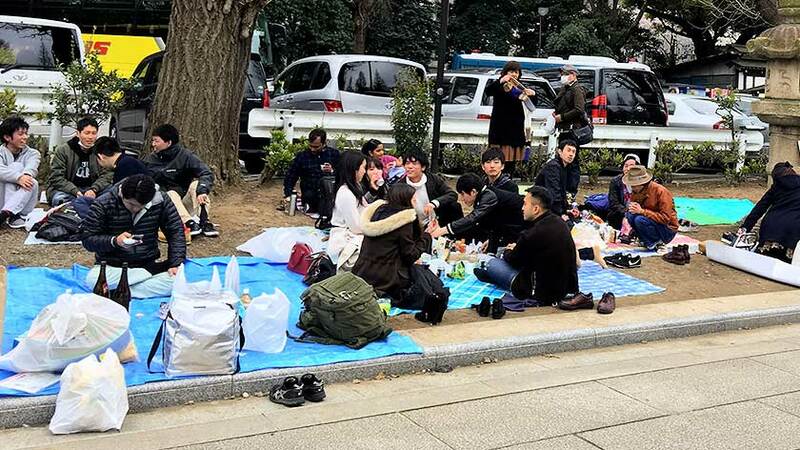 While some parks may have tables set up, the vast majority do not and most people will put down a blue tarpaulin sheet and sit on the ground. If you use a wheelchair, this unfortunately means you may not have a table so you might want to bring something to put on your lap like a tray. Unrelated to disability, you may want to buy some drinks/snacks before going as the prices at the food trucks are 2-3x higher than normal. This article makes it sound like a horrible experience – but it isn’t, its great! We just want you to know what it is like so you can prepare and get the most out of your cherry blossom viewing. It is a great way to get a taste of Japanese culture and nature all at once. 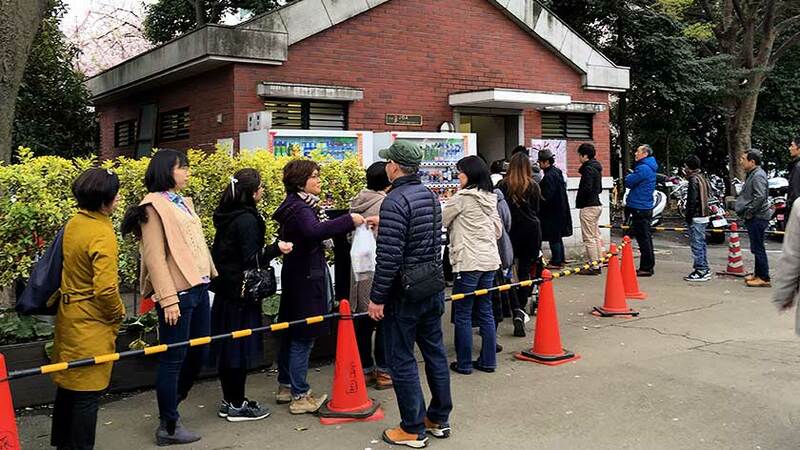 It is because this is a once-a-year opportunity that people from all over Japan flock to see the cherry blossoms – you should too. 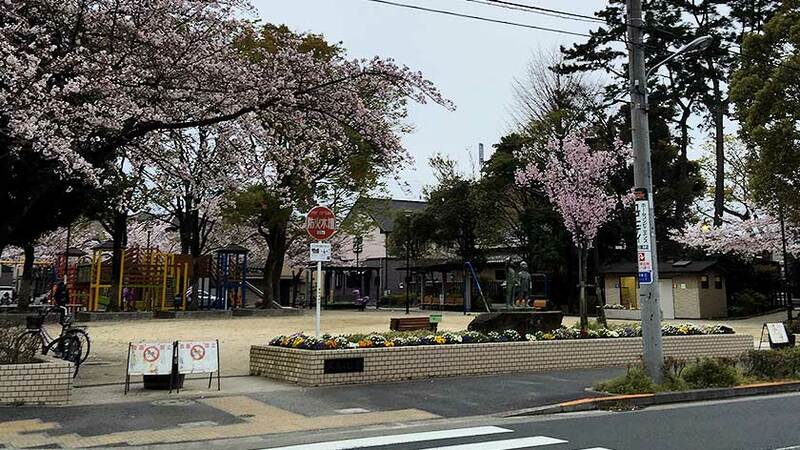 If the crowds are to much for you, you will be happy to know that there are small parks – like the one below – in every neighborhood of Japan that have some cherry blossom trees that you can leisurely enjoy. The flowers bloom at different times of year depending on location and weather patterns. In fact, they have cherry blossom forecasts! The best English forecast can be found at Japan Guide.